By using OrthoGraph I, you can export your work result into different file formats. Besides the 2D floor plan - DXF - and the 3D model with all the BIM data - IFC -, our users have also an option to extract all numerical and textual information – including calculated values, like surfaces, volumes, perimeters - in the most spread format for further use - XLSX. Use photos, annotations and custom parameters – the program allows you to document every detail of the building you work on. 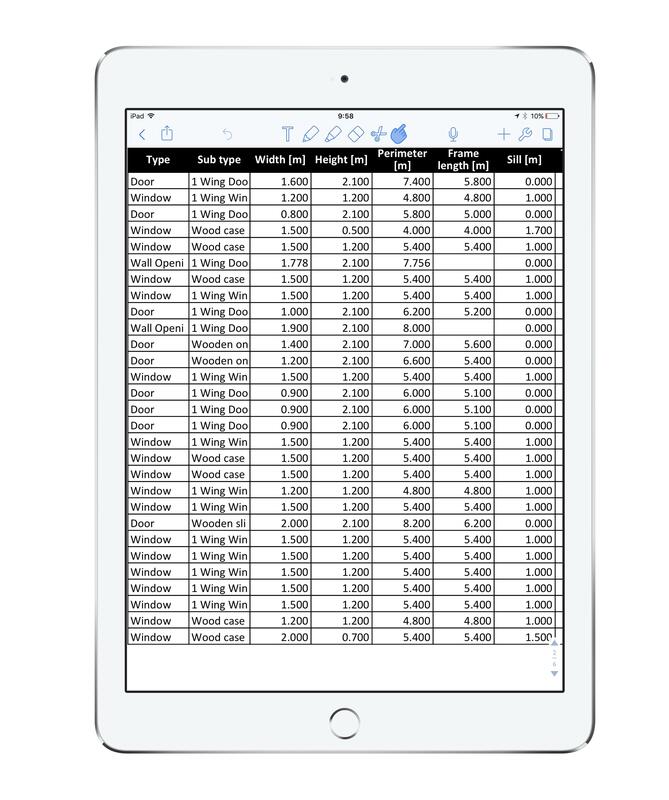 Get calculations on surface values, volume, and perimeter on site - and export them to your clients in PDF format. Export all important data regarding the floor plan to an .XLSX file with a simple click! The software automatically generates 5 sheets, each of them with different detailed information. On the first sheet, the user get a list of all created locations with their properties and a detailed report regarding each location will be created as well. On the second sheet are the openings listed with all their properties and the containing location. The third sheet contains every object from the floor plan with the properties. Hotspots and wall sections are also collected in a separate sheet. Have you ever thought of how great it would be to have a detailed room book of what you have drawn and measured on the spot? All rooms with their drawings, furniture list, sizes, calculations and even with the images you shot on-site? We did. Create so called "room books" with a click. 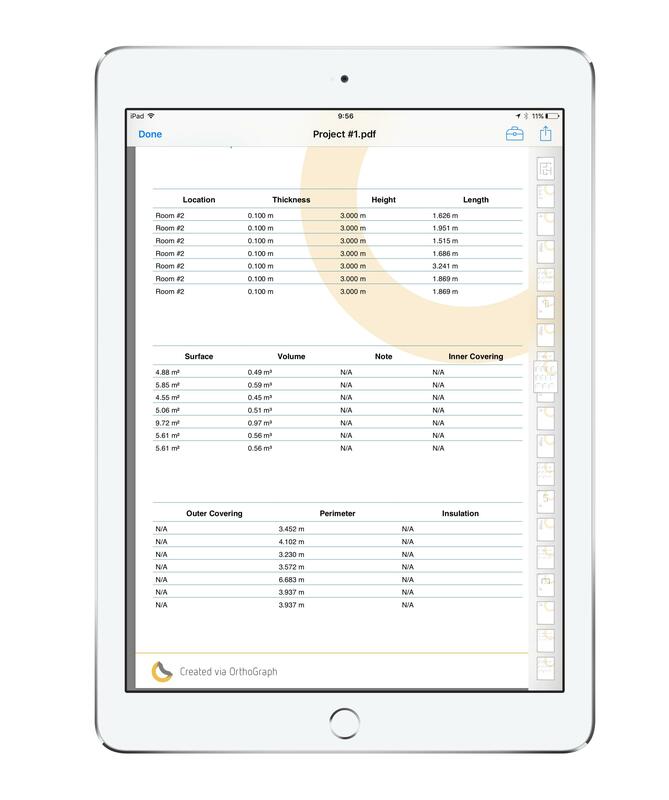 The App automatically generates the PDF file containing well arranged and detailed data and pictures about the full project. 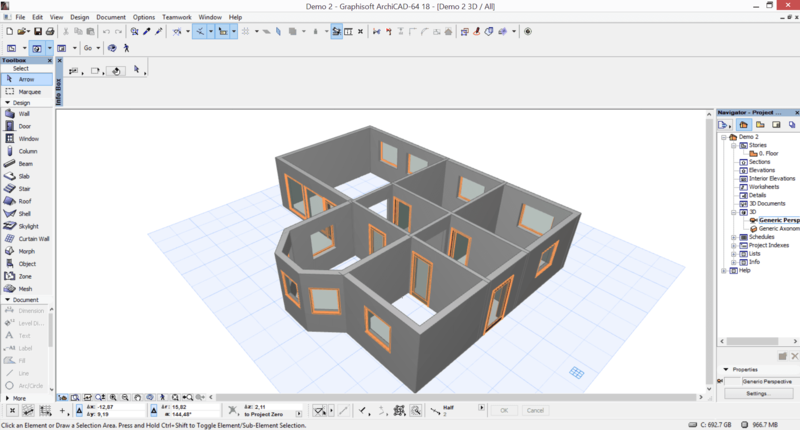 The PDF export feature of OrthoGraph I includes everything you drawn, measured and entered into the floor plan. Use it as a professional architect, painter, tiler, forensics with all details or as a retail agency containing fancy renders of the flat you wish to introduce. OrthoGraph is a native BIM App by design. The software handles several BIM (Building Information Modeling) properties, such as complex hierarchical location structures, doors and windows with opening directions and unlimited number of properties, walls with attributes, moreover, you have over 100 intelligent objects to represent the equipment and machinery of the built environment. All this complex BIM data can be exported into IFC and DXF files, which can then be used in several CAD and BIM software platforms.